Because our communities are so small, many visitors are amazed to find out that Te Anau and Manapouri has plenty of pre-school care and vibrant schools including a college. We are rightly proud of our schools and many of our children schooled right here in Fiordland go on to the University of Otago and other universities or other institutions across New Zealand and the world, and a range of professions, with great success. Heavily focussed on giving children an opportunity to develop through experience, this amazing Te Anau kindergarten (next to the primary school) takes its older children out into park land for the whole day once a week; in all weathers. Their 'nature discovery' days involve children sliding down mud banks, discovering plants, and toasting marshmallows. It's all good, character-building Fiordland folk stuff. The kindy has also been known to put on utterly amazing full-length plays, entirely acted by pre-schoolers. Simply incredible. Go to the Fiordland Kindergarten website. Southern Stars Early Learning Centre is a community owned early childhood education centre. A team of qualified early childhood teachers are committed to quality education and care for the children that attend up to a maximum of 35 children (0-5 years of age). It is open Monday-Friday 8am-5:30pm, and closed for two weeks over Christmas and the usual statutory holidays. Southern Stars has a great range of resources and activities for the children with a large outdoor play area, where they can learn as they play. There is a big focus on creating a family-friendly atmosphere, using natural resources for open-ended play, and also a big emphasis on 'moving to learn', with many opportunities for children to develop and practice hand-ball-eye skills, and large muscle activities (running, climbing, swinging). The team at Southern Stars ELC also runs a programme called "Southern Adventures" where four of the older children spend a morning a week 'exploring' the local community (some conditions apply). Some "Southern Adventures" include walking on the Kepler Track, exploring around the local community (Police Station, Airport, the water towers), spending time on the shore at Lake Te Anau and Lake Manapouri, and local farm visits. For more information go to www.southernstars.co.nz or visit their Facebook page. For additional play groups run by parents go to Community Clubs. Registered childcarers, who provide care for pre-school children in their homes, is another option in Te Anau for families needing care for under fives. Footprints provides care for 0-5 year olds, and can take up to four children at any time. Go to Footprints' website. Te Anau School is at the heart of our community, and an innovative primary school at that. Their slogan is "Climbing our way to the top" which emphasises their commitment to success, and their connection with our mountain wilderness. The school might be in a small town hours from a city, but Te Anau School manages to give our rural kids a chance to experience everything, from ski-ing trips in Queenstown (there is no ski field in Fiordland) to going on "camp" in Dunedin to experience its museums and city life. Kids on camp are given challenges such as budgeting for their own meals and shopping for their own food. One of the school's projects, "Money doesn't grow on trees" involved sending out kids to busk in Te Anau; giving the kids musical confidence and developing their understanding of money. The school also puts on productions, and recently put on Dr Zeuss's The Lorax, a fun musical with a strong conservation theme. On the athletic front, the school prides itself on promoting sport and even has a polar plunge fundraiser every winter, during which kids run in to Lake Te Anau in fancy dress. We breed self-sufficient, hardy kids here in Fiordland who really care about their environment and have a lot of fun. Visit the school at the Te Anau School website. There is no primary school in Manapouri; however to enable children to get to Te Anau School, all outlying areas of Te Anau including Manapouri are well serviced by free school buses at the start and end of the school day. Mararoa School prides itself on being a small, rural primary school with a great family like atmosphere. 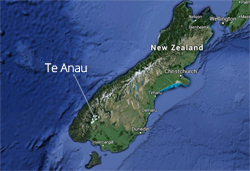 It is located at The Key, about a 15 minute drive from Te Anau or Manapouri, on the road to Mossburn. The school is served by free school buses from Manapouri and outlying areas of the Te Anau Basin. Families in Te Anau are able to use the Intercity bus service to get their children to school in the mornings and utilise the school bus service in the afternoons. Mararoa School teaches children from new entrants up to year eight in two multi-level classes. The school's vision is to provide each child with 'key learning for Life's Journey', and this is demonstrated through its innovative teaching and learning programmes, excellent outdoor education opportunities and development of young leadership skills. The school is well resourced with a modern library, technology room, swimming pool and extensive sports grounds. Children are encouraged to make good use of the outdoor space, climb trees and develop excellent sport skills. The junior class have a weekly outdoor learning programme which they call 'Down the bank' – where children are encouraged to play and work together in the outdoors. As part of its Enviroschool programme, the school has recently added a native garden to its grounds. Alongside sport and environmental studies, the school also encourages participation in the Arts. Every three years, the whole school perform a musical production – these are sometimes performed in a local woolshed, much to the delight of the Te Anau/Manapouri community. For more information about Mararoa School, visit the Mararoa School website. The great thing about living in Fiordland is that the schools go all the way up to 18 years of age, despite the fact we are in a remote region. Fiordland College in Te Anau is a terrific school, with lots of attention given to a comparatively small number of pupils. This is a school where the principal can easily know all the names of all the students; there are only about 200 pupils. The school motto is: "Reward for Effort". What you put in, you get out. The school says: "We pursue educational excellence within a safe and caring environment and pride ourselves on the quality of educational experiences we are able to provide our students. Academic, sporting, cultural, environmental, outdoor and leadership opportunities are all catered for and our dedicated, highly qualified and friendly staff care about the needs of every student. The small class sizes and individual attention provided enable a personalised approach to learning. As a result our students are all-round achievers who enjoy academic success and do well in their chosen careers." Go to the Fiordland College website. Again, access to Fiordland College for pupils living some distance away in Manapouri or a nearby rural area is by free school bus. One of the most exciting projects to emerge in Te Anau involving our schools and kindergarten is Kids Restore the Kepler, which is a project led by the children of Te Anau, in partnership with the schools, the community, and the Fiordland Conservation Trust. The project helps tackle the terrible problem of invasive bird-killing pests in the Kepler forest (rats, stoats, possums and cats) through trapping programmes to protect and restore birdlife in higher numbers. Go to the Kids Restore the Kepler website for more information.